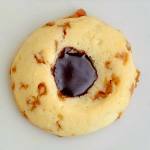 Toffee Chocolate Thumbprint Cookies – a shortbread-like thumbprint cookie dotted with bits of toffee candy and filled with rich chocolate. For over 200 more tried and tested cookie recipes, visit our Pinterest Cookie Board. Spouse got the idea for these tasty little thumbprint cookies from a picture in a magazine. We decided to use our own tried and true thumbprint cookie recipe and adapt it to include the toffee chips and chocolate ganache filling. The result was a little too good and these were scarfed down within hours. Next time I’ll make a bigger batch. Toffee Chocolate Thumbprint Cookies - a shortbread like thumbprint cookie dotted with bits of toffee candy and filled with rich chocolate. Add the vanilla extract and egg yolk. Beat until smooth. Fold in the flour and toffee chips until a soft dough forms. Form into 1 inch balls and place on a parchment lined baking sheet. Make a dent in each ball with your thumb or the handle of a wooden spoon. Bake at 350 degrees F for about 20-25 minutes or until lightly golden brown. You may have to take them out of the oven in the last few minutes and repress the centers with a wooden spoon to maintain the centers deep enough to fill with the chocolate. Cool completely on a wire rack before spooning chocolate ganache into the center of the cookies. Pour the scalded cream over the chocolate chips in a warm bowl. Let stand for 5 minutes before stirring in the honey until smooth. Spoon into the center of the cookies and allow to cool completely. Scald means just before the boiling point. I use the microwave. Scald means just before the boiling point. I do it in the microwave.